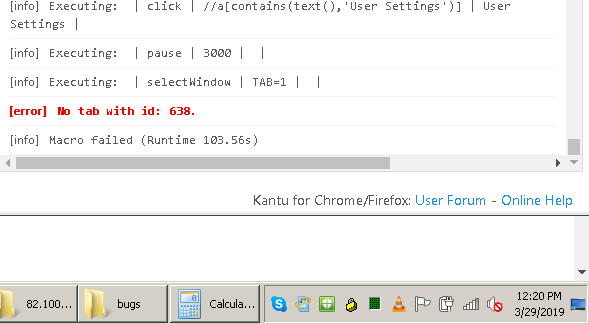 [error] No Tab with id - Forum for Kantu Task and Test Automation and the free OCR API. I’m going through a workflow right now where a pop-up appears, and the user has to press “Allow” in order to login to the page. [error] No tab with id: 1585. Seems like since the user was previously focusing on pop-up window, it is no longer able to complete any other actions since the window is no longer available. I tried using “selectWindow” again to focus back in the main window/tab, but that also returns the same error. Has anyone else ran into this issue and figured a way to get around this in Kantu? As a test and potential workaround, if you add an Open command after the tab has closed (to reload the main page), or maybe a Refresh, does this fix it? FYI, I had roughly the same error (not sure it was exactly 1585, but something similar) in a different context. I was running a bunch of macros (via the “Export as HTML plus autorun” method) from a script. I realized that I was triggering the next one prematurely, so that it would be concurrent with the previous. Once I resolved(*) that, the “[error] No tab with id: 1585” problem went away. FYI & FWIW. (*) In case you are interested, I am triggering the driving script to launch the “next” macros by having the “previous” macro save a csv file called “termination” when it is done. The driving script waits for this file to appear before launching the next macro. However, because this file gets created before Kantu completes running the “previous” macro (showing the “macro completed” or whatever notification). I guess it needs to do some cleanup before the next one starts. I “fixed” this problem just with a short delay in the driving script, which works but is not very satisfying. I’d be interested in any suggestions about the “right” way to achieve this. Thanks. No tab with id: 2653. Page opens up in tab0. User clicks a link and this link opens up in new tab tab1. on tab1 user clicks on a link which opens up in new tab, i.e tab2. now on tab2 user closes all other open tabs. now only tab2 is only in the browser. user opens up some url and it is opens up in new tab. I did the refresh and pause but that did not work for me. I can not share the script as it is in private area. May I request you again admin.